They chose 64 companies and put them into a Wimbledon-style draw, and asked readers to vote over a series of rounds. In round 1, for example, readers could choose between L'Oreal and Alphabet or Walmart and Starbucks, or CitiGroup and Exxon, Toyota and Starbucks. The draw was seeded, keeping Apple, Amazon, Netflix, Tesla apart in the early rounds. The winner, announced yesterday, was...Alibaba. It overcame Amazon in what I consider would be a fascinating 5 set finale. A Federer-Nadal classic, or perhaps (less appetising but more appropriate) a Xi-Trump sumo wrestle? 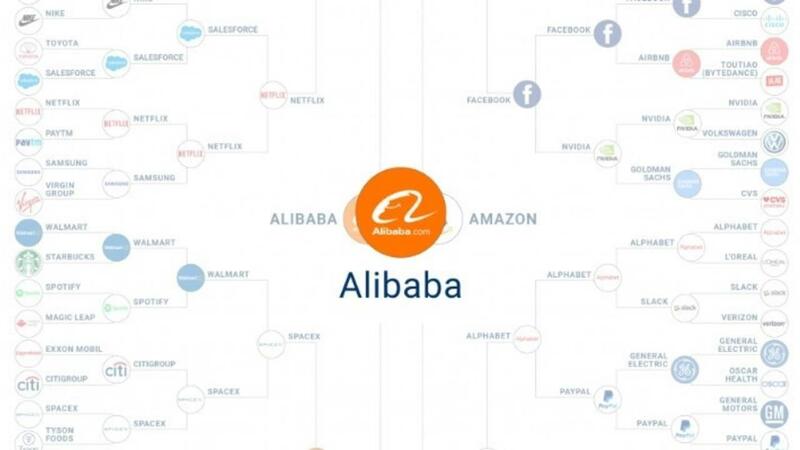 Some highlights: in the Round of 16 Baidu beat Uber and SpaceX knocked out Walmart. Other notable victories were Nike against Saudi Aramco and Nvidia against Volkswagen (disqualified for spaghetti stringing). Alibaba had a relatively easy route to the semis, dispatching Novartis, Disney, Tesla, and SpaceX. It then surprised many by demolishing Apple in the Semis. Amazon by contrast had had some gruelling encounters with Tencent, Facebook and Alphabet and looked a little battle weary by the final. ...But the real reason why the survey is so prescient lies in the business models of the respective companies. Leading business analysts call this new breed 'platform businesses' or 'ecosystem orchestrators'. 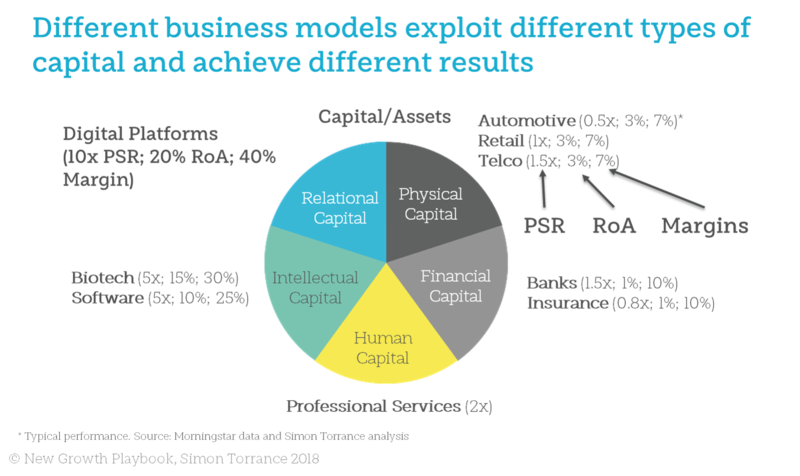 Most companies have a predominant business model, based on exploiting a certain type of asset. They perform differently, as the chart below shows. Platform/ecosystem orchestrators exploit relational capital. 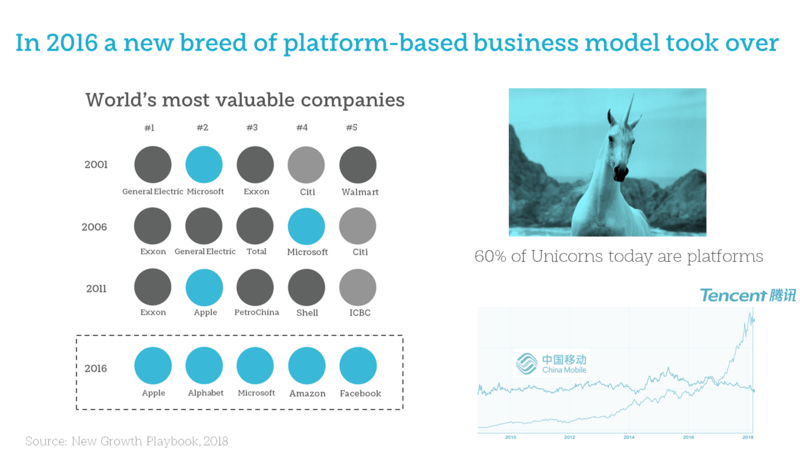 For some 'pure plays' (like Tencent, Priceline, Uber, Facebook) it forms their predominant business model. For others (like Apple, Amazon and Microsoft) it forms a significant proportion of their overall business model mix. So the key point for this article is that the winners in CB Insights survey represent this new breed of companies, who we might call 'Digital Hybrids'. They have managed to create over time a synergistic business model portfolio that exploits relational capital to a significant degree. Traditional incumbents have not managed to do this. Amazon evolved its portfolio from 2001-2017, from a 99% retailer of physical goods to a 'digital hybrid' via significant investment in ecosystem orchestration and digital services. It made a bold decision in 2000 that its future lay in creating an open platform and orchestrating a network of buyers, sellers and developers. It still invests a huge amount in the sale and distribution of physical goods, but its 'growth flywheel' is powered by a strategy based on network orchestration which in turn generates enormous quantities of data which it turns into insights about users' needs and wants. There's a short video case study on Amazon here. With this sort of winning example, we can help incumbent organisations plan their own way forward. Here's an example I did for one company recently (without the market valuation impact numbers, which were significant). The Board are now excited about where they can invest to increase the value of the company. So, what makes Alibaba and Amazon, and semi-finalists Apple and Alphabet, so special (stocks that you want to hold on to ahead of others) is that they don't try to do everything themselves. They leverage the power of ecosystems, platforms and the data generated from and by them to create new ways to generate sustainable growth and value. Traditional incumbent organisations are just waking up to the power of this approach and starting to think about how to emulate it. Most have the latent assets required, but lack the in-depth understanding of how to create these new types of hybrid business model portfolios and how to implement network orchestration. The Economist said this week: "For large incumbents, in 2018 digital strategy will stop being about trendy experiments and start being a matter of life and death." I couldn't agree more. My job in 2018 is to help them understand why successful strategy in the digital economy requires a 'digital hybrid' business model approach. I've created a new course to help execs understand how to make this transformation. World Economic Forum: is your business model fit for the 4th Industrial Revolution? Chief Digital Officers - How to avoid frustration and make a bigger impact?